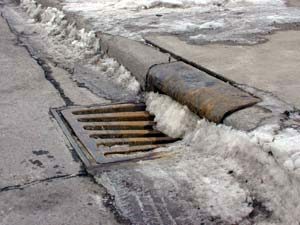 Road salt spread on the streets of Ann Arbor, MI has a corrosive effect on this sewer grate. Many cities and states are looking for a less damaging, and more environmentally sensitive alternative to road salt. McKinney says he has tested the corn-based products, and is satisfied that they work well. But he says Peoria will only use them if the price comes down. And there may be evidence that will happen. The market for corn and soybean based de-icing products has increased by a thousand percent over the past seven years, largely because producers are finding cheaper ways to make the products. And as demand continues to increase, manufacturers say the price will keep dropping. For the Great Lakes Radio Consortium, I’m Jonathan Ahl.